For this exhibition, each artist presents a window-space, conceptually and figuratively, through which the nature of making art is studied and analyzed by looking at traditional forms, media, and technique. Often, the limits of material and process are challenged. Varying from romantic to dark, we are facing scenes where questions on value systems, gender, labor, and time underlie as well. While drifted in the flux of distracting imagery of our time, these paintings make us slow down and contemplate together with the staring and stared figures in these simply presented yet loaded settings. Raha Raissnia’s high-contrast black and white paintings in the show are derived from her films. The artist learned to paint from filmmakers and musicians rather than painters. Her films, drawings, and paintings are closely imbricated: paintings are contrapuntal compositions catalyzed by film stills, transferred faintly onto the surface of the panel and elaborated upon with oil and gesso. Her films echo this archaeological process, constructed from fragments of earlier work and structured as overlapping pairs of 35mm slide and 16mm film projections. Raissnia’s drawings and collages, likewise comprised of image transfers, with Sumi ink and compressed charcoal, examine this relationship of mutual influence. All are guided by the materiality of their media. The artist’s densely textured work draws in equal measure on the gestural and photographic, the figurative and abstract. It features passageways to indeterminate locations and irrational architectures. “My paintings brought abstraction to the vision I captured from the world on film and now the films are bringing elements of reality into my paintings," Raissnia says. 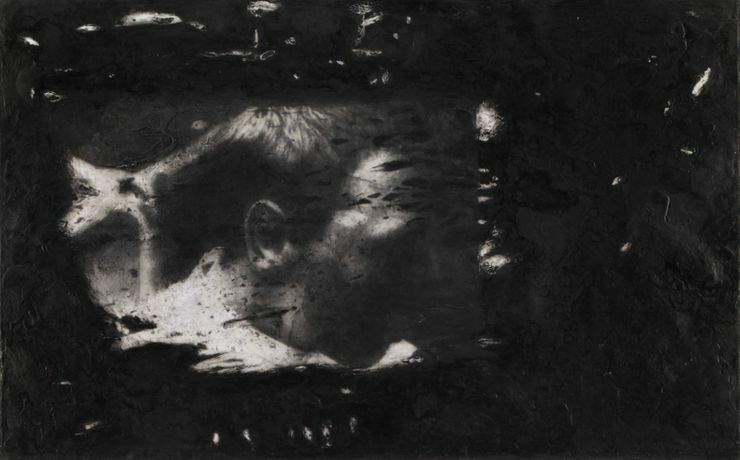 Her viewer is left with the (impossible) task of excavating the two. Jessie Edelman’s work explores issues from throughout the history of painting that have an impact on contemporary art. Her recent work has taken the role of the observer or spectator as the painting’s subject. She turns the viewer’s orientation to the mise en scène, such as a rocky ocean outcrop or a meadow and explores the position of the figure within it. The work spans a high-low range of image viewing, from film stills to travel photos to Impressionist paintings. The paintings she creates in her paintings emerge amid textured and gestural brushstrokes combined with highly developed and rich color palettes. Summer Wheat’s paintings are characterized by expressive structure and color that challenge the limits of material and process. She centers her subject matter upon the figure and narrative, and utilizes her painting technique—pushing acrylic paint through wire mesh—to create rich, fiber-like surfaces. Wheat explores ideas of female empowerment through the lens of Egyptian pictography. While looking at renderings of men pouring water, cutting fish, and moving carts around—essentially “running things” in daily life—Wheat seeks to superimpose a series of women into their places, thereby telling the same story slightly differently. The large-scale tapestries in the exhibition are windows zooming in a beehive where masculine roles are taken over by women.